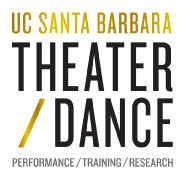 During 2010-11, the department received a National Endowment for the Arts, American Masterpieces award to stage the seminal dance piece Speeds (choreographed by Jennifer Muller) on the UCSB Dance Company. Additionally, a one day scholarly conference was hosted by the department. Read what the editor of Dance Magazine writes about the department's one day conference on American choreographer Jennifer Muller. The editor of Dance Magazine interviews Jennifer Muller at our 2011 dance conference. A one day scholarly and artistic conference dedicated to students - an historical conversation about Jennifer Muller and the changing world of American modern dance starting in the 1960s and 1970s. Friday, April 8, 10:00 a.m. - 5:30 p.m. Opening reception: Friday, April 1, 2011, 5:30 p.m.
Jennifer Muller residency, conference and exhibit was made possible by a grant from the National Endowment for the Arts and funding from the UCSB Interdisciplinary Humanities Center, UCSB College of Letters and Science, UCSB Office of Research, and private donors. Jennifer Muller has been an influence in the dance world for over 40 years. With her visionary approach to dance / theater, innovative multi-discipline productions incorporating the spoken word, live and commissioned music, artist-inspired decor and unusual production elements, Muller has defied convention and created a distinct signature style, educational approach and philosophy. Artistic Director of Jennifer Muller/The Works since its inception in 1974, the company has toured 39 countries on 4 continents, 30 states in the USA and produced 20 NYC Seasons. Playwright and choreographer, Muller has created over 100 pieces - including 6 full-evening productions - and designed lights, decor and costumes as Stageworks. With a history of notable collaborations, she has worked with such artists as Keith Jarrett, Keith Haring and Yoko Ono. Creating pieces since age seven, Ms. Muller danced professionally at age 15 as a member of the Pearl Lang Dance Company, followed by 9 years as Principal Dancer with the José‚ Limon Company [during which she graduated from the Juilliard School] and 7 years as Associate Artistic Director of the Louis Falco Dance Company. Her work has been seen on stage in 41 countries and, on television, in the US, Spain, The Nederlands, Germany, France, Russia, Costa Rica, Australia, China and Japan.